After various forays into the worlds of Star Wars, The Simpsons, and, um, patterns, Minecraft takes a stab at something a little more classical: ancient Greece. 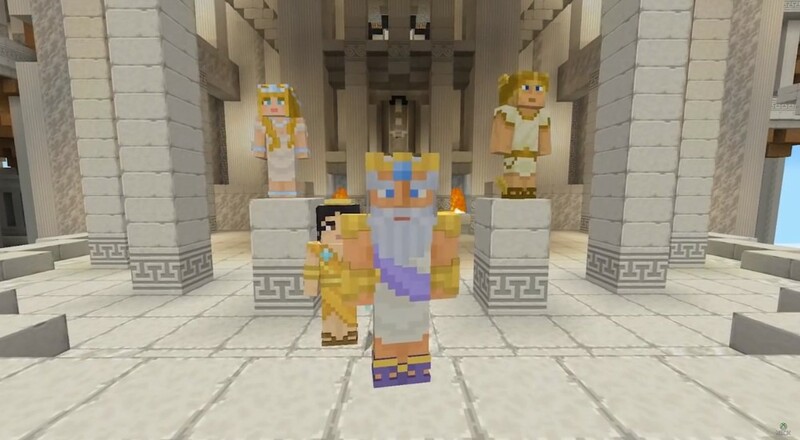 The new Greek Mythology DLC for Xbox One and Xbox 360 editions of Minecraft let you run around in a world of acropoli and minotaurs, just like you were already pretending to do. A custom texture set, an orchestral soundtrack, a new UI, and 39 unique skins await you in this mash-up pack. Yeah, there's a lot of marble stuff to build with. But you know what? That's history. Not nearly as historical are all of the mythological figures you can encounter while playing. Satyrs and hydras? Check. Cerberus and Prometheus? Oh yeah, they're there. Helen of Troy, Medusa, Achilles, Theseus, Zeus, Perseus, Haded, sea monsters... ok, you get the picture. It's a little bit of history, a lot bit of mythology. The Greek Mythology DLC for Minecraft: Xbox One Edition and Minecraft: Xbox 360 Edition is currently available on the marketplace for $3.99. Better brush up on your mythology so you don't mistake Cadmus for some guy who makes delicious chocolates.